Gwen shows the custom tote bag she made at The HUB’s makerspace. Kids used the vinyl cutter and T-shirt press to make custom tote bags earlier this week at The HUB’s makerspace inside Mentor High School. Harper waits for the vinyl cutter to print her design. Printed their choice of design on our vinyl cutter. Put the design on the tote bag and the tote in the heat press. Well, actually we put it on the heat press because the press up to 270 degrees fahrenheit, and we don’t want anyone to burn their fingers. In 10 seconds, the press forces the design onto the tote. After a few seconds for everything to cool down, the kids have a trendy tote of their own. You too can make a tote. The whole craft only costs about five dollars, which pays for the bag itself and the vinyl. 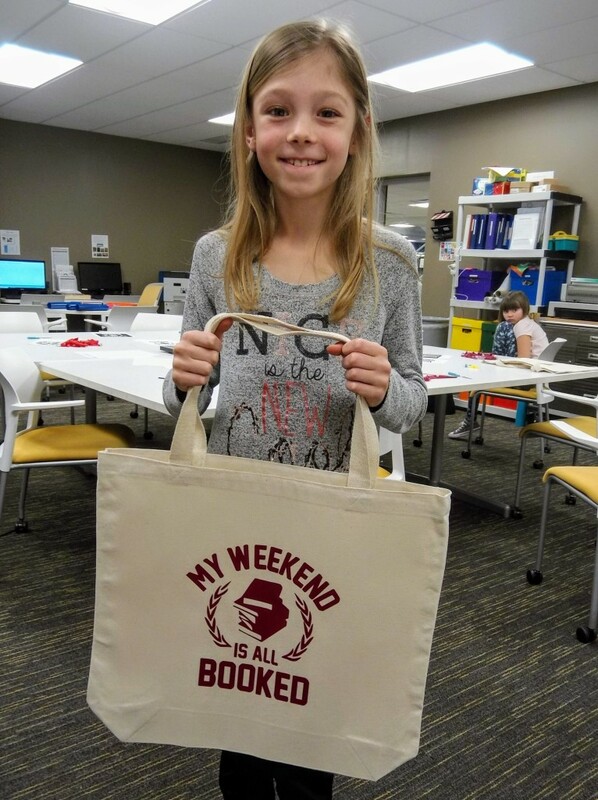 If you want to use the makerspace at The HUB, you’ll need to buy your own tote but we’ll provide the vinyl for the design. 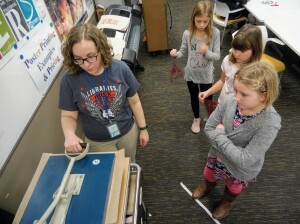 Ms. Ariel, our HUB manager, uses the heat press to make custom tote bags. Just to be clear, you don’t need to be a student at Mentor High School or even a resident of Mentor to use The HUB’s MakerSpace. All you need is a Mentor Public Library card in good standing. an introduction to the laser engraver at either 4 or 6 p.m. on Monday, Jan. 21. Get inspired for your next project and leave with an engraved souvenir. learn about the vinyl cutter, as well, at either 4 or 6 p.m. on Monday, Jan. 28. Discover what you can create with the cutter and get your own vinyl souvenir. All these programs are free to attend. However, we do ask that you register ahead of time. You can sign up online at our event calendar or call The HUB at 440-205-6011. 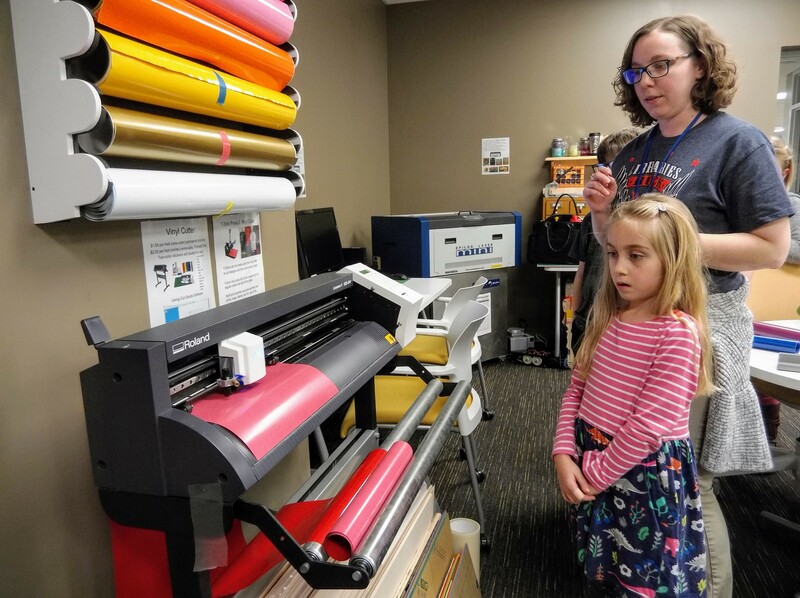 This entry was posted in Uncategorized and tagged Makerspace, Mentor Public Library, press, The HUB, vinyl cutter. Bookmark the permalink.